Performance Alerts allow you get an instant notification if an athlete is injured or sick, for a combination of factors like high stress and low sleep, through to percentage changes in performance or even a new Personal Best. Steps 1-6: Specify the alert criteria. It is CRITICAL that you set this up correctly or you may miss alerts or get them too often! Any Activated Alerts will appear. This is covered in the lesson on Activated Alerts. Click on "Set up Performance Alerts"
Click "Create new Performance Alert" to create a new alert. You can also view/edit existing alerts on this page. To view or delete an existing Performance Alert, click on the name of the alert to be taken to the alert settings that you can modify. To create a new performance alert click on the "Create new Performance Alert" button on the top right of the page. There are 7 important steps to setting up a Performance Alert and theses Steps are outlined in the lesson here and the subsequent Performance Alerts lessons. The following is a brief overview. #1: Name the Alert. This is the name that appears on the Activated Alerts list, on any e-mails that are sent and on the List of Alerts you set up. Make sure it is named clearly and appropriately. #2. 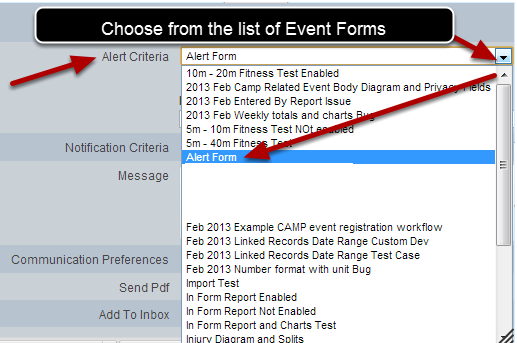 Alert Criteria: Select which Event Form the Alert is going to apply to. You can set up an alert to fire when that Event Form is entered or updated. Alternatively, you can add filters so it only fires when specific criteria are met. #3: Notification Criteria: This outlines when you want the alert to fire, e.g after the first save, when changes occur for the event, through to a change in status. #4. Message: Set up your Message: this is the message you receive via e-mail or SMS, or through the internal mail saying what alert has been triggered. Please note that the message cannot be larger than 120 characters if you are sending it via SMS. If it is longer than 120 characters the SMS message will not be sent. #6: Additional Communication Preferences: set up additional preferences for where the notification is set and what information is sent with it. #7. Click "Save" and then set up who is monitored by these alerts and who needs to receive a notification if the alert is triggered. This is the name that appears when the alert fires through to an e-mail, text message and internal mail. It needs to be labeled appropriately to ensure the person being notified know exactly what alert they are getting and why. For the purposes of testing we are naming this alert "Poor state and low score" because we are setting up this alert to only fire to if state is poor and the athlete has a low score. -The alert to fire when a new record is entered or updated (e.g. each time a new entry is made or even updated in the system). 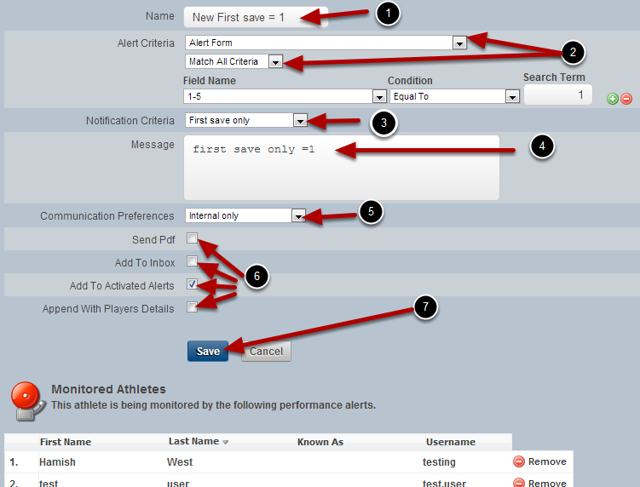 -The Alert to fire ONLY when specific data is entered for an athlete. The next step explains this in more detail. If you want the alert to fire for this Event Form every time it is entered then select "No Alert Criteria"
If the Alert Criteria are set to "No Alert Criteria", when this event is entered for a user who this alert is set up to monitor, an alert will be fired regardless of what information is entered into the actual entry. However, if you only want to receive a notification when specific data is entered about an athlete then criteria need to be set up. See the step below. To set up an Alert to be sent when All criteria are met (e.g. when injury is "severe" AND pain is greater than 6) choose the "Match All Criteria". To set an Alert to be sent when ANY criteria are met (e.g. if the injury is "severe" OR pain is greater than 6) choose the "Match Any Criteria"
The difference between the Match ALL and Match ANY criteria is that if only one of the fields is entered using the Match Any Criteria, the Alert will be triggered. If you select "Match All Criteria", ALL of the criteria MUST have ben met or the alert will not be triggered. For this example we are going to use the Match All criteria. All of the Event's Fields appear for use as a filter. Select the Field that you want to use for your criteria. For this example we are selecting the field "1-5". You can see that a number of alert conditions can be set up. Choose the one that meets your requirements. Now add in the search term that the condition needs to meet. Depending on the type of field you selected you will have different options to select for the Search Term. #1: In this example you can see that this alert will only fire when a 2 or less is entered. "1-5" is less than or equal to "2"
State is equal to "Injured" OR "Rehabilitation". 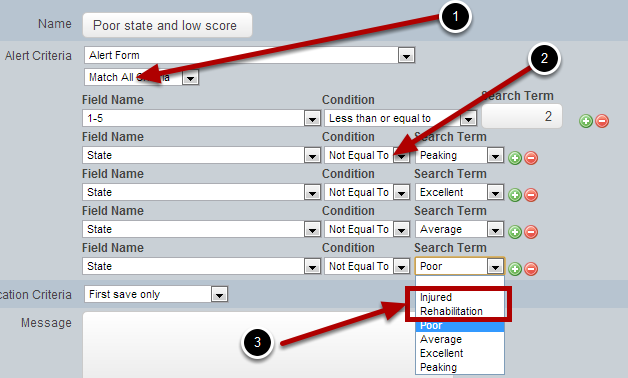 Because we used the "ALL Criteria" we cannot set up the alert with State = Injured and State =Rehabilitation as an athlete cannot have both of these fields selected for them in an event form at the same time (they are either injured or in rehab, not both). Instead we have to set the alert up to fire when it is not equal to the other state conditions, so that if the player is injured or in rehab the alert will fire. This is done by select all of the other conditions and specifying that the alerts needs to fire when state is "Not equal to" each additional condition. Setting up alerts can be tricky based on what you need to set up. Please ask your distributor for help if you need it.